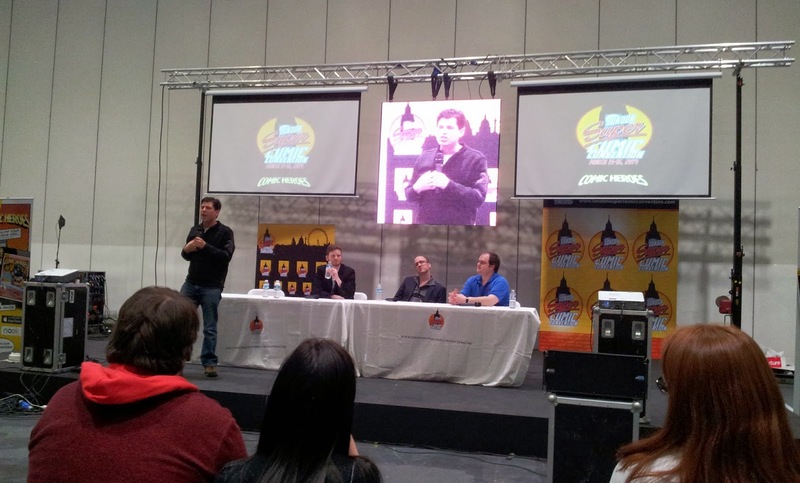 Stewart R: A successful opening, single February day event with Stan Lee as the guest of honour followed one year later by Neal Adams, J Scott Campbell, Herb Trimpe and Dan Slott making the trip over from the US for an expanded weekend convention in 2013 showed that the London Super Comic Convention could entertain the crowd-grabbing talent and strengthen on the lessons learned from hosting an event in a steadily growing and crammed convention schedule. 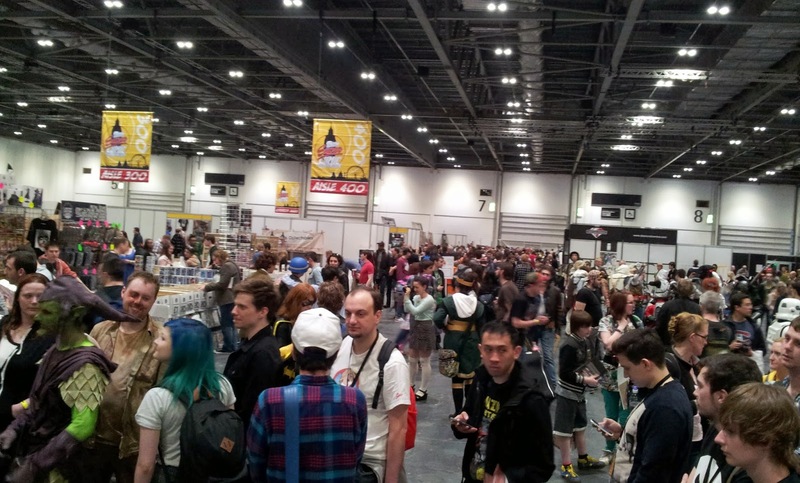 Leading up to this past weekend there were hopeful positives along with a few bumps of doubt that had LSCC 2014 sitting in that ‘let’s see how this goes’ camp. While certainly a broad list of comic book writers, artists and publishers had confirmed their attendance, skimming through the growing list and timed announcements showed that perhaps the top industry names had elected to remain at home or confirm with events elsewhere. Brian Wood had been confirmed in the initial list of names, but unfortunately had to cancel and the wealth of European artists, working for Marvel particularly, seen the year before - Isad Ribic, Matteo Scalera, Gabrielle Dell’otto to name a few - were not seemingly making the repeat trip. That said, names of note like Arthur Adams, Max Brooks, Jonathan Ross, Charlie Adlard and the returning Dan Slott were likely to get the diehard fans out while also appealing to those casual comic book reader who may recognise the odd name from other endeavours. The UK still seems unable to grab the organised attention of Marvel or DC for convention purposes, yet Avatar, IDW and BOOM! had all confirmed their presence which indicated that LSCC and the UK market was worthy of their attention and attendance. Certainly the previous two years had made a good impression on the PCG and in spite of various work, family and financial commitments a good few of us made it to the Excel to see how well the organisers could solidify their standing in the calendar. Following a reasonable night’s sleep at a nearby hotel those of us attending the whole weekend were up early and ready to tackle the anticipated queues which had changed in their shape, depth and longevity through the previous two years. All credit to the organisers who this year managed to separate the day ticket holders from the early bird weekend ticket holders into two distinct lines and the press and pros booth was clearly identified and well located this time. I actually stood in the day ticket queue from 9.30 (my press pass arrived on the train after doors opened), had my ticket scanned and wristband allocated while I stood there and was inside the exhibition hall, along with the 200 odd folks in front of me just 4 minutes after the gates were opened to all at 10am. That’s a great development for a con that saw queuing of 45 minutes or more in its debut year, though it must be said, having the Excel Centre entirely to yourself for the weekend will definitely help to organise visitors in an efficient manner! Once inside it was clear to see that the floor template utilised the year before was the preferred choice and offered a good balance of Exhibitor and Retailer lanes, a compact, yet not claustrophobic Artist Alley, and the space for two panel rooms this year, a definite improvement straight off the bat from the single room last time. It was also evident that the number of retailers appeared to have increased significantly and that there would be no lack of long boxes to dig through over the course of the two days, though the quality was still to be ascertained. 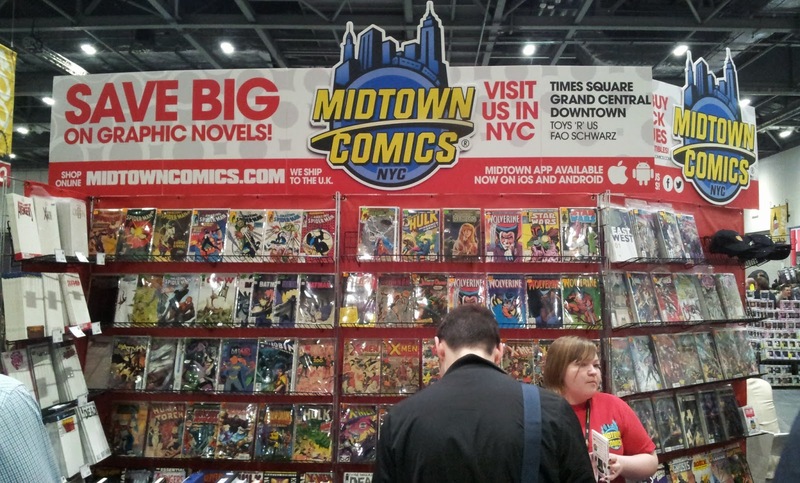 Midtown Comics had definitely come back from New York in a bigger format, bringing a stall twice the size of their last effort, this time focussing on shifting trade paperbacks and graphic novels rather than boxes of back issues. Dan Slott’s queue was also immediately identifiable as it snaked away with fifty or so eager fans patiently waiting for a signature from the incredibly accommodating writer who was kept busy through the entirety of the weekend. Having walked around in something of a haphazard fashion for a couple of hours it was time to dive into the first of many panels we intended to sit in on. The Comic Book Legal Defense Fund is something I’ve heard of, am aware of, and believe is a positive force in the industry, yet I knew nothing of its history and so the 'Comics On Trial! : The Story of Comic Censorship' panel hosted by Charles Brownstein was to be my education. While Brownstein didn’t deviate greatly from the powerpoint history of comic book censorship, the story itself is incredibly interesting and hearing of the plight and poor treatment of various writers and artists during the 20th and into the 21st Century it’s clear that the CBLDF is a much needed presence. Then it was time for one of the travelling publishers to show us their upcoming wares and answer questions from the public. The 'We Are BOOM!' panel was hosted by Editor-In-Chief Matt Gagnon and it was clear that he is a man who believes in his company’s product and strengths as he unveiled upcoming projects which should make this Summer an interesting prospect. Top of the list is the John Carpenter approved Big Trouble In Little China comic which is to be written by Eric Powell, with story assistance from Carpenter himself, and illustrated by Brian Churilla. All through the presentation we were witness to a slew of ‘I Am BOOM!’ video bits from creators and Powell’s effort was top notch delivering a hilarious and spookily accurate Jack Burton-on-CB-radio impression to express his pleasure at being offered the chance to write the series. Gagnon was then joined on stage by artist Michael Dialynas to talk about his experiences with BOOM! and the upcoming series The Woods which he’ll be working on with James Tynion IV. Publishers are always bringing the talent along to show support in panels, but in Dialynas it was clear that he enjoys the work he does for BOOM! and is thankful for the opportunities that he’s had. When the questions were offered out to the crowd it was the expected run of queries about properties already covered in the panel and things that Gagnon couldn’t fully go into due to timing so I piped up and asked how much time and attention they gave to the UK and international market as they grow as a company, not least in light of their appropriation of Archaia and its host of foreign works. Gagnon was earnest and forthright in his answer, stating that the UK sales figures get looked at and studied on a weekly basis and that the international market was a very important part of their focus currently and moving forward, their attendance in London being an example of that. My last panel of the Saturday was the IDW panel, and like the BOOM! guys before them they showed a genuine pleasure in being in the UK, though towards the end of the day it was certainly (and amusingly) clear that the distance travelled and time difference was troubling Editor-In-Chief Chris Ryall as he mixed up names and products and was eagerly teased by gravel-voiced compatriot and VP of Marketing Dirk Wood, who brought a level of fun to the whole affair. The original highlight amongst the many property franchises detailed was definitely Chuck Dixon and Butch Guice’s Winter World which should certainly look good and the premise of a frozen future Earth and the brutal lives that humans have to endure sounds like it could be a winner too. Sunday had a couple of panels on my radar with the ever-entertaining Dan Slott given an hour to speak on his ongoing Spider-Man work and upcoming Silver Surfer series. An hour spent listening to the animated scribe is an absolute must if ever you’re given the chance and his anecdotes and insight into his childhood and work with Marvel always brings up something new and interesting. The crowd at the panel was a little lighter than expected, especially as the queues at Slott’s own table remained constant throughout the two days, but Sunday’s general footfall was lighter on the whole and didn’t seem to reach its peak until after lunch. The Avatar panel was similarly sparse in terms of audience, though we were treated to Max Brook’s bubbly style of presentation along with Simon Spurrier and Kieron Gillen’s succinct and confident mannerisms as they explained what Avatar specifically allows them as writers to deliver in something of a repeat to the panel I got to see at NYCC in October. The second day certainly felt lighter to me in terms of attendees with plenty of elbow room at the majority of dealers through several points and so I took the chance to ask several people how they thought it compared to the previous year. 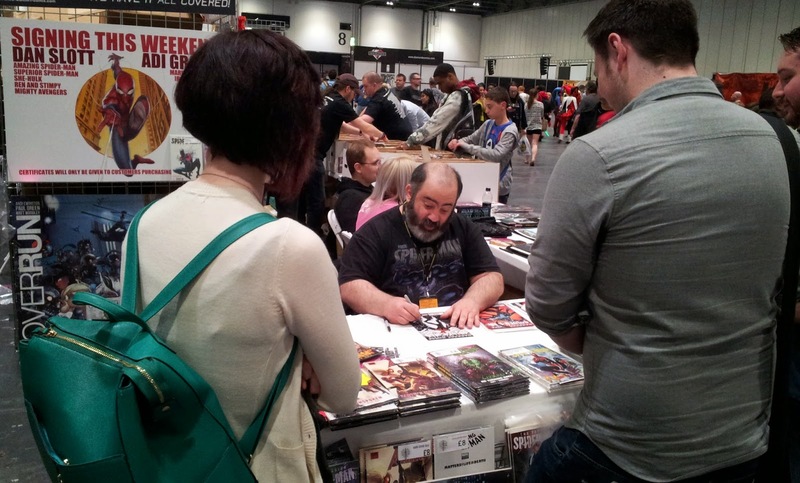 Friend of the blog and writer/artist Nye Wright stated that he’d had a better and more rewarding weekend than the previous LSCC with sales being pretty darn good. The guys at Subversive Comics stall indicated that they’d had a better weekend thanks to the decision to mix the small press section in and amongst the bigger names in Artist Alley which had seen their footfall increase. I even got chance to ask the young lady working the Midtown Comics stall what she thought about the retailer’s second trip across and I got the feeling that the vibe was positive though I’ll make the assumption that success will be judged on whether the well known shop sends over another contingent should we get an LSCC for 2015. With many thinking that business was good and that the convention went well I’d guess that we’ll get the opportunity to walk the halls of the Excel Centre again next year. The previous events straddled the half-term break which might have boosted crowd numbers and with a myriad of other events in neighbouring halls perhaps my perspective on the footfall this year was skewed a little by the surrounding hustle and bustle from 2012 and '13. The biggest surprise of all seemed to be the lower turnout of cosplayers over the two days, though the number in full costume (and of all ages) must have easily passed the 200 mark. The cosplay competition straddled the two days and perhaps it was that spread which maybe had some attendees planning their days a little more carefully - do the majority of the cosplay crowd find enough enjoyment and interest at the stalls, in panels and in the longboxes to warrant being at an event for two days straight? Possibly not, and that may have made a difference though the grand finale on the Sunday afternoon was definitely standing room only. As a comic book fan I certainly enjoyed another visit to London Super Comic Convention and am very happy to see that the organisers are improving the show year on year. The retailers from both sides of the pond seem to be offering a broader range of back issues, the adjustments to Artist Alley and the small press contingent seem to be benefiting everyone involved, the guests remain varied and relevant and the increase in the number of panels (and power of the speaker systems!) gives people a further reason to spend the whole day at the Excel, if not the whole weekend. For me personally, attending both days was a very worthwhile decision and I still didn’t get to speak to everyone I’d intended because there was so much to do. Roll on LSCC 2015! Matt C: Unlike my colleague Stewart, I only had time for a 'fleeting' visit this year. In reality it wasn't fleeting at all, as I made it up for the whole of Saturday - so half of the show all told - but it seemed to zip by at such an incredible rate that I felt like I'd only just got there before I was turning around to go home again. But they say time flies when you're having fun, right? 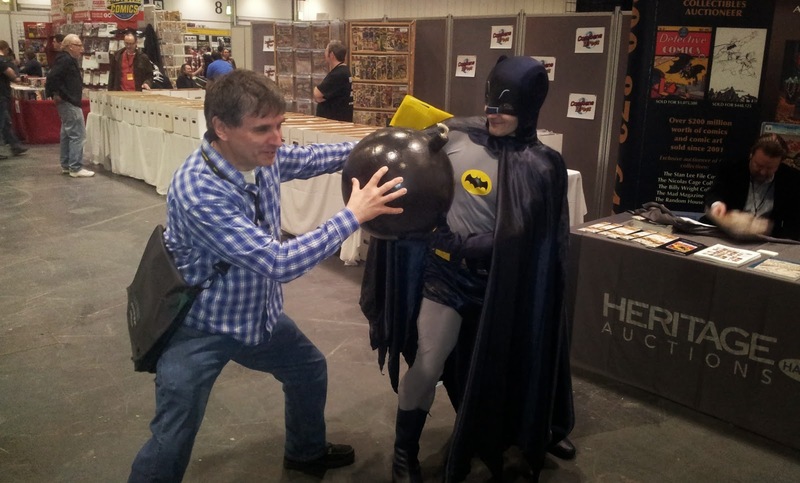 Is this fan helping Batman dispose of the bomb, or refusing it? Well, I had tonnes of fun, rushing around the stalls, keeping my eyes out for bargains, filling various gaps in my collection, and just generally soaking up the atmosphere. I made it to the aforementioned CBLDF panel which offered a good run through of the history of comic book censorship, but my highlight of the day was the 'Revenge' panel with Jonathan Ross and Ian Churchill. Okay, so I wasn't especially impressed with Revenge #1 when it appeared a couple of weeks back, but Ross has been a presence in British popular culture for well over two and a half decades now, his love comics well known, so there was no way I was going to miss it. Revenge was a big part of the conversation, and I can see more of the angle Ross is approaching it from now even if I remain unconvinced it's for me, but he can undoubtedly talk the legs of a donkey, is a genuinely funny guy and clearly knows his stuff. It's also interesting how different he is in this kind of environment, the snarky persona he puts on in his public appearances replaced by a much more easygoing, erudite and undeniably quickwitted fanboy. My short stint at LCSS this year means the small press and artists sections barely got a look in and, unfortunately, I didn't catch any of the cosplay competitions. There were plenty of Supergirls, Posion Ivys and Harley Quinns to divert the attention (there were some guys dressed up too, but, you know, I'm a red blooded male!) 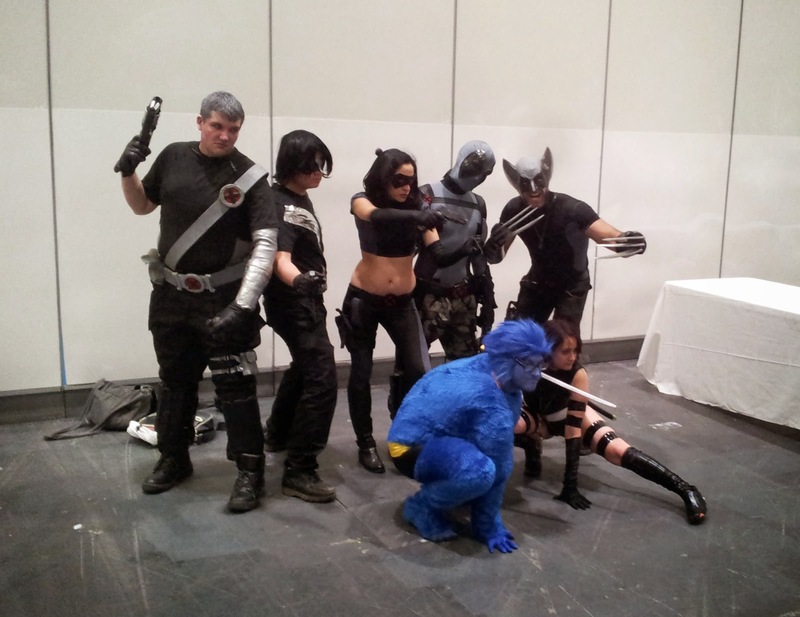 but as Stew suggested there did feel like something of a seperation between the comics side of things and the cosplay side of things, at least more than there has been before. That could be because my focus was elsewhere this year (old Captain America back issues, to be precise!) and taking a step back I don't see it as a major problem - there were plenty of people milling about in every corner of the exhibition hall, and they all had smiles on their faces, blatanly having a great time. 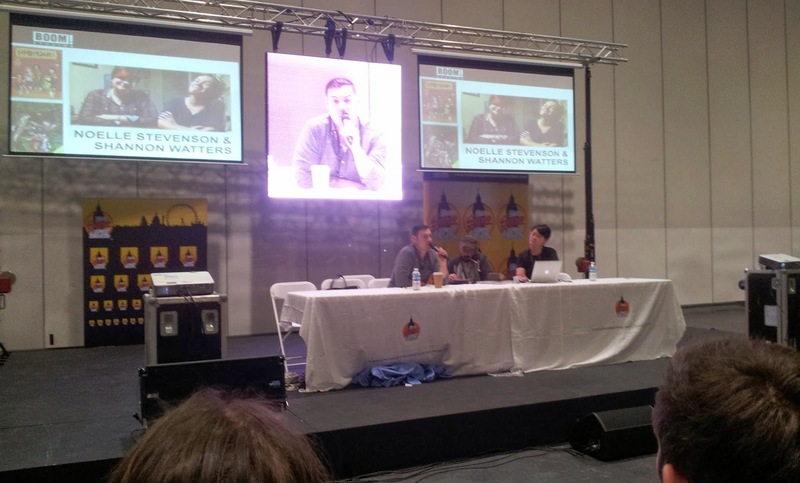 I had a great time too and, bar unforeseen circumstances, London Super Comic Convention 2015 is a lock for me. Let's hope the likes of Marvel, DC and Image will join us next time to take things to the next level!